House and/or Arrested Development fans take note: the main reason to watch The Oranges is for the strong performances of Hugh Laurie and Alia Shawkat as a father and daughter with a unique problem. Laurie stars in this off-kilter comedy as David Walling, husband of Paige (Catherine Keener). Theirs is a troubled marriage. Shawkat plays their daughter and the film’s narrator, Vanessa. She’s 24, lives at home, is single, and can’t seem to get her life off the ground. Her brother Toby (Adam Brody) has been spending time abroad, but makes a visit home for the holidays. Across the street lives David and Paige’s best friends, Terry (Oliver Platt) and Cathy (Allison Janney) Ostroff. Their daughter is a rebellious 24-year-old (who was once best friends with Vanessa), Nina (Leighton Meester), who announces her engagement over the phone from a loud party. Her parents are horrified, but in short order Nina shows up at her parents’ door, heartbroken after breaking up with her fiancé. Got all that? The Oranges has a fairly complex set of intertwining characters, but first-time feature director Julian Farino (best known for television directing, including many episodes of Entourage) does a good job setting it all up. The crux of the plot involves an unexpected romance that suddenly develops between the 50-something David and his friends’ 20-something daughter Nina. Naturally stunned by the fact that their trusted friend (and someone who witnessed Nina’s upbringing from birth) would engage in a torrid sexual affair with their daughter, Terry and Cathy recoil. Even though their marriage was troubled, Paige can’t believe her husband would do this either. Caught largely in the middle is Vanessa. Shawkat has some touchingly authentic moments as she tries to comprehend how her former childhood friend (who ended up far more popular with the guys than she did) is now sleeping with her own father. Along with Shawkat and Laurie, the rest of the cast goes a long ways towards making The Oranges as watchable as it is. Whether it’s a shortcoming of the screenplay (by Ian Helfer and Jay Reiss) or Farino’s direction, nothing especially interesting happens in the film’s third act. That’s the big weakness here. The cast is great, the scenario is rich with possibilities, but dryly comedic tone turns increasingly silly as it moves toward a disappointingly pedestrian conclusion. The Blu-ray hits the right technical notes, with a sharp picture and clear 5.1 DTS-HD MA mix. Ever wanted to count the freckles on Alia Shawkat’s face? Nah, me neither but the detail is good enough here that you could if you’re so inclined. The mix delivers flawless dialogue and perks up a bit during the resonant acoustic score. Special features are limited to a ho-hum trio of promotional featurettes. Direct-to-video films can be a real gamble, but luckily with all these familiar faces you can rest assured that the ensemble cast delivers the goods. The Oranges ends on a lazy, phoney-seeming upbeat note. David and Paige’s son Toby feels like deadweight in the plot when he arrives in the midst of the drama (no one bothered to tell him what was going on while he was away). 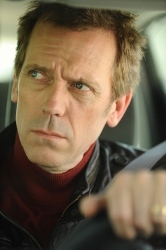 But Hugh Laurie, Alia Shawkat, and Leighton Meester manage to keep things pretty interesting until then.